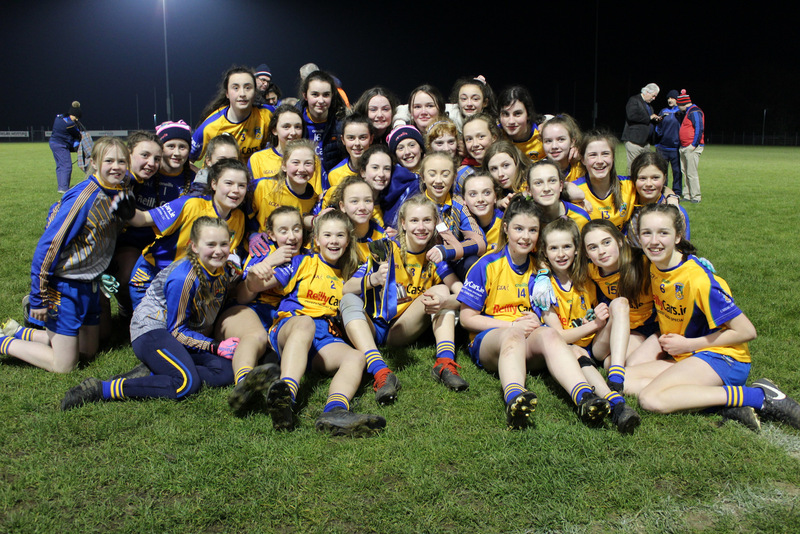 In a rip-roaring contest, Longford emerged victorious in the Leinster U14 C Championship on Friday night under lights in Coralstown Kinnegad. Longford led from the start but Wicklow loomed large in this game and the result was far from definite right up to the final few minutes. Longford opened brightly and set running at pace at the Wicklow rearguard with Eimear McDonagh instrumental in setting up the Longford attack. Longford raced into an early 0-07 to no score lead with Emma Shannon, Anna Hayden and Kate Shannon all registering scores on the scoresheet. Longford Captain Ella O’Reilly led by example and she too split the posts before Wicklow got themselves off the mark and indeed brought themselves right back into contention with a brace of goals; Laci Shannon and Emma Nesbitt ensuring the Garden County stayed in touch with their rivals as they trailed by three points at the break; 2-01 to 0-10. Longford hit two goals early in the second half to put them in the driving seat; Keala Brady and substitute Rachael Penrose raising green flags for their side. Great credit is owed to both goalkeepers; Wicklow’s Holly Wright and Longford’s Louise Tierney who both enjoyed fine outings in their respective jerseys much to the enjoyment of the large crowd that had gathered in Kinnegad. Wicklow’s Elizabeth Burke gave her side some hope as she netted on 43 minutes to put seven points between them but Longford were defiant and despite Laci Shannon hitting a second point, Longford ground out a 2-13 to 3-02 win, due chiefly to a fine defensive performance from ‘Player of the Match’ Ella Duggan. From her wing back berth, Duggan was a threat moving forward while still shepherding the ball away from her side’s defence. In his presentation, Leinster President Dominic Leech paid great credit to both sides for a fine performance and thanked the Management teams from both sides for their continued support and hard work with the players in their charge! Both sides will now get set for the new look All Ireland U14 competition which starts shortly. Longford Scorers: Emma Shannon (0-04, 1f), Keala Brady (1-01), Rachael Penrose (1-00), Ella O’Reilly, Kate Shannon, Mia Shannon, Anna Hayden (0-02 each). Longford: L Tierney, C Heaney, S Egan, C Crossan, E Duggan, K McEntire, T Tiernan, E O’Reilly (C), E McDonagh, N O’Brien, K Shannon, M Shannon, K Brady, E Shannon, A Hayden. Longford Subs: C Murtagh for McDonagh, R Penrose for O’Brien, F Talabi, I Fay, N Smith, A Burke, G Cullen, E Boyle, S Gallagher, S McKeon, S Farrell, C Hopkins, N Finn, C Morgan, M Glennon. Wicklow: H Wright, E Kinnear, A Cleary (C), G Murphy, C O’Brien, A Harmon, E O’Toole, K Keogh, A Harty, E Doyle, A Dignam, A Magee, A Roche, L Shannon, E Nesbitt. Wicklow Subs: E Burke for Harty, P Cullen Dunne for Doyle, A Traynor for Cleary, E Murphy for Nesbitt, E O’Reilly, N Gorman, L Gill, R Byrne, E O’Dwyer, A Brennan, E Callaghan, A Smullen, C Fadian, E Deehan.